Why is there a high failure rate of customer experience (CX) initiatives? And why do most CEOs not buy into CX? Because CX professionals and companies are not practicing a Real CX. Many CX professionals currently assess customer experience through the lens of biased ‘service’, and are becoming “A man with a hammer”: Always adopting the “Serve Customers Better” approach to try to solve every CX problem their respective clients or companies face. The Conventional CX is just service-in-disguise. It’s merely an expanded version of ‘service’ or customer interaction management (CIM). It is not a Real CX. 1. It includes ‘product’ and ‘pricing’. 2. It objectively assesses customer experiences. 3. It renders non-biased solutions to CX problems. 4. It can generate quick wins. 5. Its role is strategic, not functional. 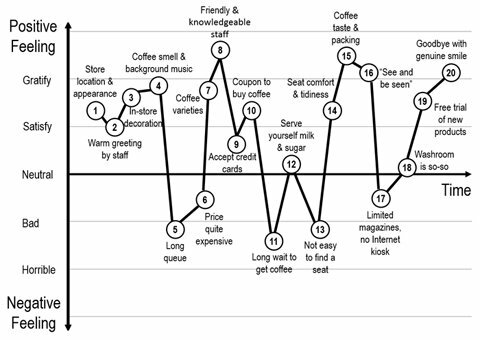 As early as 2006, when I mapped the Emotion Curve [note 1] for the Starbucks in-store experience, price and coffee are included as shown in figure 1. Throughout the article, ‘product’ is barely mentioned and ‘pricing’ is completely forgotten. ‘Customer experience’ is by and large the expansion of ‘service’ – from a pure service environment branched out to cover every customer interaction, ranging from customer service staff to all personnel interactions with customers. Its core nevertheless is “Serve Customers Better.” Approaches similar to Disney Institute’s are commonly found everywhere in the CX industry. When a brand delivers their brand promise [note 4] repeatedly and consistently, it drives brand differentiation, commands customer loyalty, and achieves business result. However, when a brand makes many promises or attempts to satisfy many customer needs [note 5] – resources are diluted – their Emotion Curve becomes flattened. Pleasure peaks are insignificant, the experience is disremembered, and the brand homogenized. Extraordinary brands chose a different path. They select some of the critical needs of customers to be their brand promise. They focus resources on their promise and relax on the remaining needs. The experience is memorable and the brand is differentiated. Extraordinary brands like IBM, Starbucks, IKEA, Louis Vuitton and Dell all have a dynamic Emotion Curve [note 6]. Yet, the price of having peaks is allowing valleys. Some people misunderstand that it is about generating pain. It isn’t. It is creating values for customers. Let me explain this with an important concept: Value Exchange. As a regular IKEA customer, performing DIY jobs is a valley. Though I can understand why IKEA makes me sweat – to channel the savings to offer the best prices for their furniture and household items (IKEA’s brand promise) – effort is still undesirable; but it doesn’t stop me purchasing from IKEA, as long as the perceived ‘value’ (i.e. inexpensive prices) is larger than the endeavor (i.e. DIY services). Likewise, being a loyal Starbucks customer, paying five US dollars for a cup of coffee is a valley. Even knowing why Starbucks has to charge premium prices – to create and maintain the Third Place (brand promise of Starbucks) – high-priced coffee is nevertheless unwanted; but it doesn’t prohibit me from buying Starbucks, to the extent that the perceived ‘value’ (i.e. the Third Place) exceeds the endeavor (i.e. premium prices). On that ground, the DIY services of IKEA and premium prices of Starbucks are Good Valleys and shouldn’t be eliminated, because they help generate substantial ‘values’ to customers – Branded Peaks – which reflect the brand promises of IKEA and Starbucks. 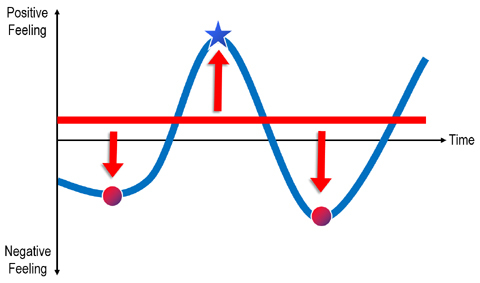 The existence of Good Valleys is to support Branded Peaks. Different brands chose – to satisfy different customers’ needs – different brand promises. We respect our customers and their choices of brand. We shouldn’t discriminate any brand promises, just as we don’t discriminate any customer needs or brand choices. All brand promises should be treated equally. 2. Create values for customers. For instance, the best prices for furniture of IKEA and the Third Place of Starbucks. These values are created through Value Exchange. Some CX experts say they just want peaks and no valleys. Are they so lacking in common and business senses to comprehend the fact that “There’s no such thing as a free lunch”? There ain’t no peaks without valleys. 3. Achieve business results. For instance, first-time purchase (acquisition), repeat purchase (retention) and referral (positive word-of-mouth). Different brands have non-identical business drivers. For example, the No. 1 repeat purchase driver of IKEA is ‘Product pricing’ [note 8] while for Louis Vuitton it is the ‘Exclusive feel of wearing/owning LV products’ [note 9]. ‘Service’ isn’t always a business driver. Therefore, excluding ‘pricing’ and ‘product’ from CX can be a big mistake. A brand could miss out on two important business drivers by doing so. ‘Price’ and ‘product’ shouldn’t be left out. Brand promise doesn’t reckon without ‘service’. Brands with promises that account for ‘service’ are generally being honored, e.g. Ritz Carlton, Southwest Airlines and Lexus. In contrast, brands are mostly disregarded if their promises are irrelevant to ‘service’. For instance, certain CX experts openly, and disrespectfully, express that brands compete purely on ‘price’ are “commodities”, “just utilities” and “won’t survive for long.” Here, brand promises are treated unequally. 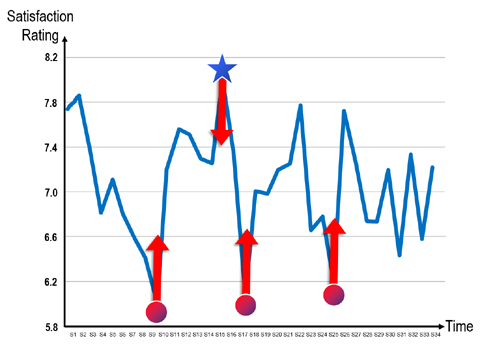 Based on 715 responses from the North America consumers through the global Starbucks research [note 10], we generate their Emotion Curve in figure 5. 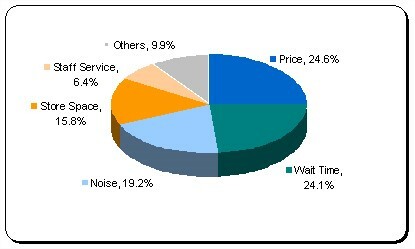 ‘Price’ is the most severe pain point out of the total 26 sub-processes and attributes. With reference to 2,318 respondents – the customers of Louis Vuitton who had purchased at least once – from a global research [note 11], ‘price’ is the valley out of 27 attributes and sub-processes of the shopping experience displayed in figure 6. Why are most CX professionals crying out to address any pain points related to ‘service’, but turning a deaf ear to deal with the ‘price’ valleys like Starbucks’ and Louis Vuitton’s? Valley doesn’t matter without ‘service’. This is the reason why the ‘service’ related pain points of IKEA and ULCCs (ultra-low cost carriers) have long been criticized, and the ‘price’ valleys of premium brand like Starbucks and luxurious brand such as Louis Vuitton are rarely a concern. Since the ‘non-service’ valleys are always out of sight: There are no other valleys; they are all ‘service’ valleys. Sukiyabashi Jiro generates numerous valleys: accept no walk-ins, reservations have to be made months in advance, located in the basement of an office building, with a modest wooden counter and only 10 tables in the entire establishment, no choice for menu, very limited time for meal, steep prices and bad service. Jiro focuses all their resources to make the world’s best sushi (product) for their diners. Ryanair adds a price tag on almost everything, e.g. excess baggage, credit card usage and a small bottle of water. They eliminate seatback pockets, blankets and airsickness bags, provide very tight leg-room and serve no free in-flight meals. They adopt mean policies like no-refund and limited airport transportation. Ryanair channels all these savings to offer the cheapest airfares (price) for their passengers. Jiro and Ryanair have delivered their brand promises, created significant values for customers via Value Exchange, and achieved the business results that might make all of their competitors envious [note 12]. Their Branded Peaks – the world’s best sushi and cheapest airfares – are strikingly apparent. Why aren’t they good CX? Peak doesn’t count without ‘service’. It explains why brands like Zappos and Virgin Atlantic are being praised as the best CX practices – as their peaks are about ‘service’ – yet Jiro and Ryanair would be labeled as bad CX because their respective peaks, ‘product’ and ‘pricing’, have nothing to do with ‘service’. As the ‘non-service’ peaks are not being recognized: There are no other peaks; they are all ‘service’ peaks. In respect of customer experience evaluation, these double standards are exactly the opposite of the objective approach of a Real CX. A branded experience means a brand delivers their promise; the brand promise appears at the peak on an Emotion Curve – a Branded Peak. While a de-branded experience is a brand fails to keep their promise; the brand promise sits at the valley – a De-Branded Valley. The Emotion Curves in figure 7 and 8 are derived from 511 Dutch and 2,187 Chinese consumers who had responded to a global IKEA research, respectively [note 13]. 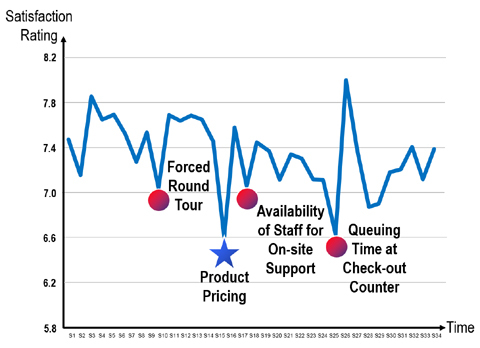 Both of them have three common pain points – ‘Forced round tour’, ‘Availability of staff for on-site support’, and ‘Queuing time at check-out counter’. However, the peak of Dutch’s experience, ‘Product pricing’, is the valley of Mainland Chinese’s. What should IKEA do? Brand promise doesn’t reckon without ‘service’. It would disregard the brand promise of IKEA – inexpensive prices – as it isn’t related to ‘service’. Peak doesn’t count without ‘service’. It wouldn’t see the peak ‘Product pricing’ of IKEA the Netherlands since it has nothing to do with ‘service’. Valley doesn’t matter without ‘service’. Therefore, the most severe pain point of IKEA Mainland China, ‘Product pricing’, is ignored. All the Conventional CX could see is the ‘service’ valleys – the three common pain points – of IKEA the Netherlands and Mainland China. Obviously, the Conventional CX doesn’t understand the authentic values and irreplaceable role of Good Valleys in fulfilling brand promises. Naturally, it would recommend IKEA to concentrate resources on minimizing or removing the three common pain points of both Dutch and Chinese consumers. The results can be devastating. If IKEA the Netherlands took the advice of the Conventional CX, the valleys – the three common pain points – would be removed and so would the Branded Peak as shown in figure 9. The peak, ‘Product pricing’, is significantly lowered for two reasons. One – Resources are diluted to eliminate the valleys. 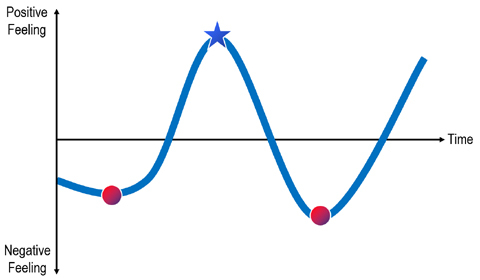 Two – These valleys are Good Valleys. The substantial resources initially saved for supporting the Branded Peak vanish. 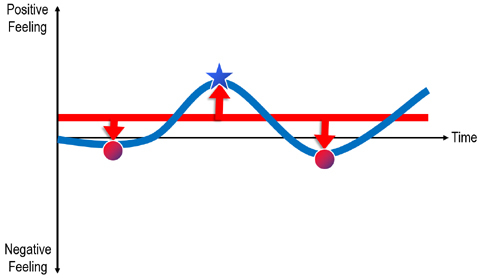 It further weakens the peak. As a result, the Emotion Curve is flattened and the branded experience becomes homogenized – a no brand experience. Similarly, the valleys of IKEA Mainland China are either improved upon or eliminated. 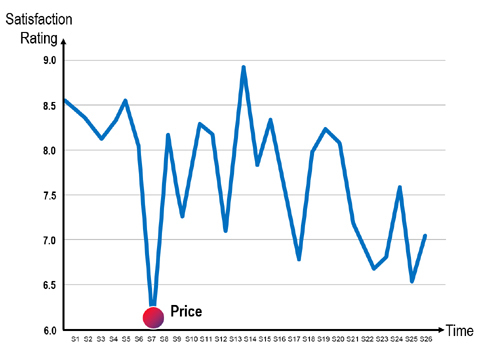 At the same time, the De-Branded Valley ‘Product pricing’ is further lowered as shown in figure 10. The de-branded experience worsens. A Real CX never discriminates any brand promise. Instead, it builds solutions around the brand promise – in IKEA’s case, the inexpensive prices. 1. Deliver brand promise. 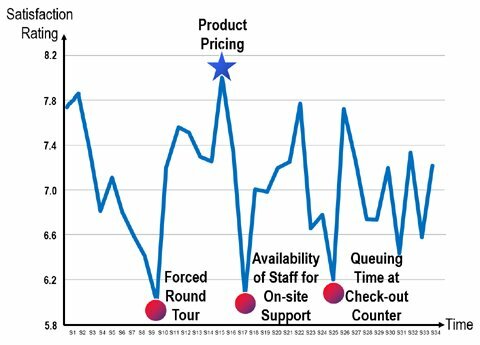 ‘Product pricing’ is located at the peak on the Emotion Curve of IKEA the Netherlands, as shown in figure 7. In other words, they fulfill their brand promise and are delivering a branded experience. 2. Create values for customers. Through Value Exchange, IKEA the Netherlands offers inexpensive prices for customers by allowing the three common pain points – Good Valleys – to support the Branded Peak. 3. Achieve business results. The Branded Peak, ‘Product pricing’, is significant and is the No.1 and No.3 drivers of repeat purchase and NPS (net promoter score), respectively [note 14]. Their resource allocation is perfectly aligned with business results. Until they reach a point where the three common pain points fall below the minimum standards (or to a level deemed unacceptable by their target customers) [note 15], IKEA the Netherlands should maintain the status quo – because they are doing a pretty fine job. 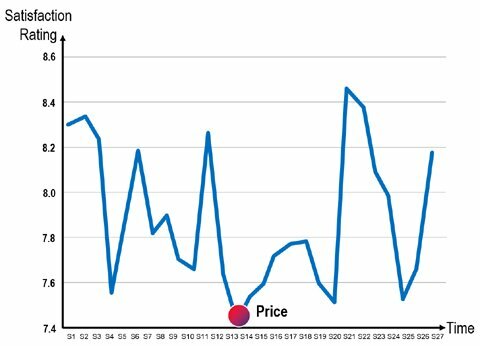 On the contrary, ‘Product pricing’ is situated at the valley on the Emotion Curve of IKEA Mainland China shown in figure 8. This means that they fail to keep their promise. Even a successful brand like IKEA can sometimes deliver a de-branded experience. Thus, the three common valleys make customers sweat for nothing when ‘Product pricing’ becomes a De-Branded Valley – the worst kind of valley – as their brand promise is broken. There are no values created for customers and of course business results are not achieved. Hence, IKEA Mainland China must convert their de-branded experience into a branded experience, by focusing all their available resources in ‘Product pricing’ to make it a Branded Peak [note 16]. A Real CX rightly points out what has gone wrong, aligns resources with business results, and gives impartial advices to ensure the delivery of brand promise. The Conventional CX is biased towards ‘service’, ignores the brand promise, creates a problem for IKEA the Netherlands and aggravates the problem for IKEA Mainland China. It misses the whole point, solves the wrong problem and creates disaster. When the Conventional CX can discern nothing but ‘service’ in brand promises, peaks and valleys, every CX issue looks like a ‘service’ issue. It’s no wonder why the Conventional CX has only one prescription. Culture transformation. The engine of the Conventional CX is customer-centricity. For that reason, the role of transforming culture or changing of DNA is exceedingly important in its solution. However, customer-centricity could be the false god of customer experience. IKEA, Sukiyabashi Jiro and Ryanair would hardly be regarded as customer-centric organizations. Still, they deliver brand promises, achieve business results and create values for customers. In other words, customer-centricity is not a prerequisite for CX success. Emotional engagement. Customers make purchases at convenience stores for ‘fast and easy’, and fly ultra-low cost carriers simply for the cheapest airfares. Sometimes, getting the job done is good enough. Don’t make the same mistake as CRM (customer relationship management) did. Not every customer would like to have a relationship with your brand. Similarly, not all customers want to be emotionally engaged. Employee engagement. There is no doubt that every company needs to engage with their employees. The matter is the extent. For instance, the degree to which Starbucks should be engaging with their employees could be very different from McDonald’s. To some companies the minimum level of employee engagement is a basic requirement; to others it might be the optimal state. The level of employee engagement varies from company to company. Service improvements. Nowadays, the expectations of customers are ever-rising. No company can escape the need to continuously improve their customer services. It is the mission of Ritz Carlton to deliver the highest level of service to their customers. Yet, IKEA might only need to enhance the three common pain points just above the unacceptable levels of their target customers. The degree of service improvement is dictated by brand promises. Are You a Responsible CX Professional? Many CX professionals are prone to the same impulsive judgements in which every CX problem is ‘service’ related. However, different brands have different promises. No one solution can cure all CX problems. What’s more, the solution “Serve Customers Better” approach is usually rendered before or without any diagnosis. Some CX experts may say that they could implement the “Serve Customers Better” approach in a more gradual manner, though the eventual end nevertheless is a full-scale and company-wide implementation. The one prescription doesn’t suit everyone. In spite of diabetes being a major health problem, I can’t imagine any medical doctor – before or without any diagnosis – giving the heaviest dose of diabetes medication to all patients with different kinds of diseases. It’s totally irresponsible and insane. No medical professionals would actually do this. Notwithstanding that ‘service’ is a major CX issue, this should never be an excuse for any CX professional to render a full-scale “Service Customers Better” approach to all companies with different kinds of CX challenges. It’s just plain wrong. Be a responsible CX professional. Quick wins are important. They prove upfront the ROI and boost morale. Quick wins allow you to get the support to continue the CX journey, which is a decisive factor in influencing the successful rate of CX initiatives. Simplify and operationalize customer journey map. Include ‘pricing’ and ‘product’ in the map. Identify appropriate quick win drivers. Many CX professionals are now building sophisticated and fancy models of customer journey map. However, sophisticated things are usually difficult to operationalize. To reverse any complication, we ought to simplify these models in order to put them into operations. 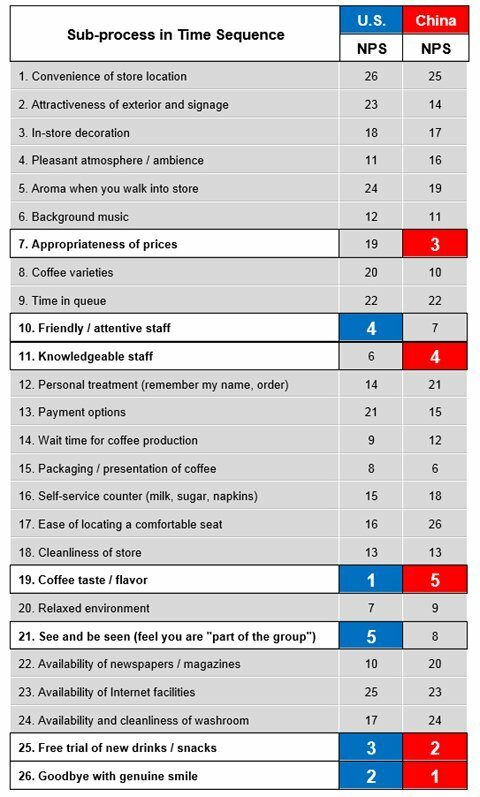 Take the Starbucks case and NPS as an example, we correlated the satisfaction rating of each sub-process during the in-store experience to the NPS (net promoter score) given by the Mainland Chinese and American customers for a global research [note 17]. 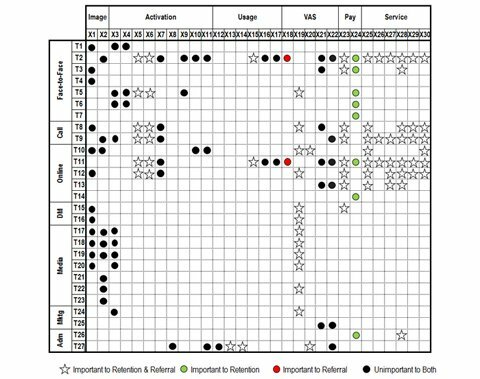 Figure 11 lists the X-VOC Data [note 18] – the importance ranking of each of the 26 sub-processes in driving NPS. With 26 sub-processes, the importance rankings literally range from 1 to 26, with 1 being the most important and 26 being the least important factor affecting NPS. Numerous companies use NPS, but not many of them know how to make NPS actionable. From now on, you can find out which particular sub-processes or attributes you need to sweat to improve your NPS. And it’s all supported by quantifiable data. The Conventional CX always leaves out ‘price’ and ‘product’ in their customer journey maps. It creates an irreversible impact on identifying business drivers. If ‘pricing’ and ‘product’ are excluded from the Starbucks journey map, two of the top five NPS drivers – ‘Coffee taste/flavor’ and ‘See and be seen (feel you are “part of the group”)’ of the U.S. Starbucks; ‘Appropriateness of prices’ and ‘Coffee taste/flavor’ of Mainland China Starbucks – would be permanently absent on the map. All the remaining NPS drivers – ‘Friendly/attentive staff’, ‘Knowledgeable staff’, ‘Free trial of new drinks/snacks’, and ‘Goodbye with genuine smile’ – are service or service-related attributes. In other words, it would become a project of pure service improvement. The whole purpose is then distorted: it would be trying to enhancing service instead of driving quick wins. For making the best informed decisions to achieve our target results, we ought to aggregate every piece of relevant data for identifying business drivers. ‘Pricing’ and ‘product’ must be included in the customer journey map. There are always options – oftentimes low-hanging fruits – for you to choose from based on the X-VOC Data. To select suitable attributes that can deliver quick wins, there are two important conditions to be met. Align or coexist with brand promise. In this sense, ‘Appropriateness of prices’ wouldn’t be a good choice and should be the first one to be taken out of the target candidate list. Because it is the Good Valley – premium prices – that supports the Branded Peak of Starbucks – the Third Place. Relatively fast and easy to execute. ‘Coffee taste/flavor’ and ‘See and be seen (feel you are “part of the group”)’ do not look like the right targets, and nor do ‘Friendly/attentive staff and ‘Knowledgeable staff’. These four attributes are wiped out since substantial time and efforts could be required to enhance them. The ideal candidates are ‘Goodbye with genuine smile’ and ‘Free trial of new drinks/snacks’ – the relatively easy targets – you would soon be able to set up inexpensive pilot projects to test out and enjoy a quick win, and most importantly, you connect CX to the target business result – in this case, driving NPS. A Real CX does not use the X-VOC Data only for generating quick wins. It adopts the data to constantly seek out the respective drivers for achieving business results, i.e. on-site purchase, first-time purchase (acquisition), repeat purchase (retention) and NPS (referral). It ensures that resources wouldn’t be wasted on irrelevant attributes. For the Conventional CX, resources are consumed for enhancing ‘service’. While for a Real CX, resources are invested in what really matters for driving business goals. B. Ordinary brands not ready for a CX breakthrough. C. Ordinary brands ready for a CX breakthrough. A. Extraordinary brands. Extraordinary brands with brand promises relevant to ‘service’ – like Ritz Carlton and Virgin Atlantic – know crystal clear what they stand for and already fulfill their brand promise by delivering a – dynamic Emotion Curve – branded experience. They just don’t need the Conventional CX. Extraordinary brands with brand promises irrelevant to ‘service’, e.g. if Ryanair and Sukiyabashi Jiro went for the Conventional CX to reduce or eliminate the ‘service’ valleys, what would happen? 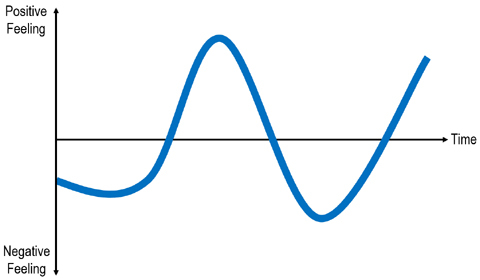 Resources are diluted, Branded Peak is lowered, and the brand is homogenized – Emotion Curve is flattened. Bad move. B. Ordinary brands not ready for a CX breakthrough. It is the largest group out of the three. There must be reasons why they are ordinary in the first place. They typically lack 1) The ambition to be extraordinary, 2) The courage to be different and go against the grain, and 3) The capabilities to create significant peaks. In short, these ordinary brands are not equipped for a CX breakthrough. Out of the fear of falling behind other companies, they are particularly susceptible to widespread propaganda – like “Customer Experience is at the top of every business’ priority list.” – Gartner – and are too quick to jump onto the CX bandwagon. Not surprisingly, these CX initiatives eventually fall short. Most likely, no improvements are made as it takes too long and too much effort for them to bear, e.g. it could take years for these brands to transform their culture or change their DNA to be customer-centric. Furthermore, without generating any quick wins, these initiatives would hardly gain adequate support to sustain or proceed further. As a result, resources are diluted and wasted, and their overall competitiveness are weakened. Wrong decision. C. Ordinary brands ready for a CX breakthrough. These brands are the minorities within the ordinary brands. They are equipped with the ambition, courage and capabilities to take a quantum leap in CX. They know what they are trying to do. However, transforming the culture or changing the DNA of an existing – especially the well-established – organization is much more difficult than a new company. Implementing the full-scale and company-wide “Serve Customers Better” approach could take years before it pays dividends, which adds to the uncertainties and risks (such as whether the sponsored C-level executive still survives, the competitive strategy or business model may have changed). Therefore, only some of the type C brands might reap genuine benefits from practicing the Conventional CX. The remains wouldn’t be successful. Based on the above brief analysis, it is a bad move for type A brands and a wrong decision for type B brands to implement the Conventional CX, and merely some of the type C brands could enjoy ultimate success. The Conventional CX is unnecessary and bad for most companies. A Real CX helps companies to deliver their brand promises, create values for their customers and achieve business results. A. Extraordinary brands. Even great brands make mistakes sometimes – e.g. unable to fulfill their promises and deliver a de-branded experience. For instance, a Real CX detects the De-Branded Valleys of IKEA Mainland China and recommends a non-biased solution to convert them into a Branded Peak and a branded experience. A Real CX unleashes the full potential of an extraordinary brand by enlarging the Pleasure-Pain Gap (the gap between the Branded Peak and Good Valley). This way, the extraordinary brand can consistently beat rivals and eliminate imitators by offering an unprecedented level of value – Branded Peaks – to their target customers. Furthermore, resources are put to their best uses. For example, the No. 1 repeat purchase driver of IKEA is ‘Product pricing’ [note 19], for Starbucks, it is ‘Coffee taste/flavor’ [note 20], while for Louis Vuitton it is the ‘Exclusive feel of wearing/owning LV products’ [note 21]. Resource allocation can be well aligned with the target objectives by identifying the respective business drivers. B. Ordinary brands not ready for a CX breakthrough. A Real CX can help the ordinary brands to focus their resources on delivering their brand promises, so that they can differentiate themselves from other ordinary brands. A Real CX identifies target Good Valleys for saving resources to support target Branded Peaks through Value Exchange. It creates more value for the customers of the ordinary brands. In addition, unlike the Conventional CX, which focuses on enhancing ‘service’, a Real CX concentrates on driving business results by aligning CX to target objectives. It enhances the effectiveness of resource allocation of the ordinary brands. Extraordinary brands, such as Starbucks and IKEA, were all ordinary brands at the beginning of their business, and started with relatively gentle Emotion Curves. Rome wasn’t built in a day. C. Ordinary brands ready for a CX breakthrough. Similar to the Conventional CX, a Real CX calls for the same requirements: the ambition to become extraordinary, the courage to allow for Good Valleys, and the capability to create significant Branded Peaks. It also has its own risks and uncertainties, and is more difficult to change for an established organization than a start-up. To be extraordinary is never easy or risk-free. However, in stark contrast with the Conventional CX, a Real CX affords companies the liberty to choose ‘product’ or ‘pricing’ as their brand promise, and not just limited to ‘service’. In addition, a Real CX can offer quick wins and achieve business results which are critical to justify further support, and hence, to raise the successful rate of the CX implementation. A Real CX is superior to the Conventional CX for all brands – type A, B and C. It is necessary and good for most companies. CEOs scarcely spare enough attention for CX initiatives. CX budgets won’t be adequate as companies’ resources are limited. You won’t be able to change the status quo with the Conventional CX. But with a Real CX you can. Let me illustrate how with the TCE (total customer experience) Model [note 22]. Figure 18 shows the TCE Model of a credit-card issuing bank. 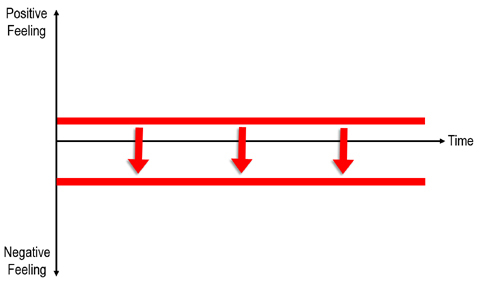 Figure 19 is a simplified version of the TCE Model for a mobile network operator. The data are derived from a research with 4,567 valid responses of credit card holders [note 23] and another research with 2,275 mobile service users [note 24]. The horizontal axis spans the customer lifecycle from experiences at X1 to X39 in figure 18 and X1 to X30 in figure 19. 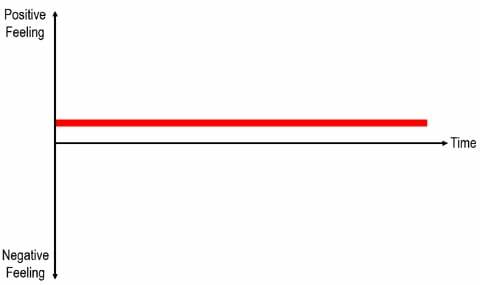 The vertical axis addresses all interacting touch-points from T1 to T27 in figure 18 and figure 19. 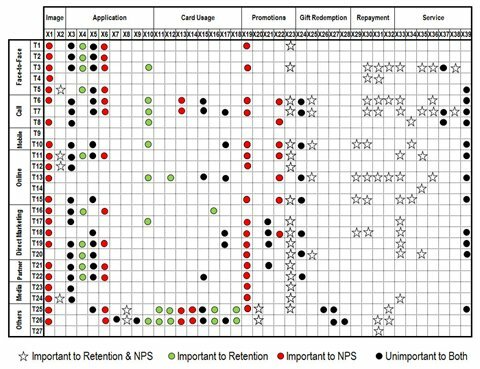 In both figures, white stars denote the touch-point experiences that are important in driving both retention and NPS/referrals, green dots important to retention, red dots important to NPS/referrals, and black dots unimportant to both [note 25]. The most important job that CEOs have is to make decisions. A Real CX rides on the TCE Model to enhance both the efficiency and effectiveness of their decision-making. 1. Make faster decisions. CEOs can visualize all trees and the entire forest in one comprehensive blueprint. Instead of reviewing numerous CX reports of each function and touch-point, the TCE Model consists of all the touch-point experiences that affect how customers perceive your brand across the entire customer lifecycle. It helps reduce the efforts and time needed for CEOs to make CX-related decisions. You would undoubtedly and consistently capture CEOs’ primary attention. 2. Make better decisions. The TEC Model illustrates the importance of each touch-point experience in driving target objectives, e.g. retention and NPS/referral for the credit-card issuing bank in figure 1 and mobile network operator in figure 2. CEOs can more accurately align resources with target business results. Instead of playing a functional role to fight for more resources, you strategically advise how to allocate the limited resources amongst different functions and departments. 3. Make fairer decisions. The data of the TCE Model is derived directly from your customers, not from any internal consultants or external authorities. It would reduce the disputes between different departments as it is a more objective and a transparent approach in resource allocation. The TCE Model links the data to business results, objectively allocates resources and might reduce departmental silos. VOC is heard and used in a meaningful context. The TCE Model is useful. But don’t get me wrong, I am not trying to sell it to you here. It is indeed more sophisticated than customer journey mapping, but it’s not rocket science. There are many brilliant brains and clever minds out there in the market who can create better models and solutions. My point is, however, that the role of CX has to be strategic in order to carry out its destined duties. As illustrated in figure 18 and figure 19, CX includes everything that customers can perceive – all experiences at the pre-purchase, at-purchase and post-purchase stages delivered by various functions and channels. That said, just because CX includes everything that would affect the feeling of customers throughout the entire customer lifecycle, doesn’t mean that it has to do everything. No functions can. The nature of CX dictates its role – strategic and not functional. If services have to be improved, leave it to Customer Service. If products or pricing are in trouble, let the Marketing folks handle that. Let the respective functions do their jobs. The role of CX should never be functional. It ought to be strategic and monitoring. It identifies what has gone wrong, where resources are used poorly and ensures brand promises are delivered. This direction is what CX should be heading towards. Without a neutral perspective, how can it render the best and non-biased solutions for companies to deliver their brand promises, yet satisfy customers’ needs and achieve business results? Therefore, the positioning of CX has to be strategic, not functional. With the TCE Model, you can change from the biased “Managing CX = Managing Service” to an objective “Managing CX = Managing TCE” perspective. With the “Managing CX = Managing TCE” perspective, a Real CX connects your CX efforts to business results. It maximizes the productivity of the limited resource of any organization in driving repeat purchase (retention) and referral (NPS) – the resultant behaviors of loyalty. On the other hand – as the Conventional CX is just service-in-disguise – when “Managing CX = Managing Service”, your CX efforts and investment will overwhelmingly concentrate on service-related initiatives and touch-point experiences. But in truth, it could be the other touch-point experiences that affect how customers perceive CX and influence customer loyalty. Would anyone in your organization dare to speak out and say that resources could be used more effectively in some other channel or touch-point? Who will voice this opinion when CX is the responsibility of Customer Service or Marketing? To maximize the effectiveness of CX, the CX function has to gain its independence. It is entirely necessary to have a Chief Experience Officer or Chief Strategy Officer – who is detached from Customer Service or Marketing and reports directly to the CEO. 1. It doesn’t include ‘product’ and ‘pricing’. The Conventional CX is just service-in-disguise. Its core value is to “Serve Customers Better”. When it doesn’t include ‘pricing’ and ‘product’, to many CEOs, it just looks like another “make customers happier” project. What kind of CEOs would put this type of customer satisfaction enhancement initiative on their priority list? 2. It subjectively assesses customer experiences. The mission of CX is to deliver brand promise. However, different brands have non-identical brand promises. Since the Conventional CX disregards any brand promises other than ‘service’, how can a rational CEO trust that it would objectively evaluate CX and create a branded customer experience? 3. It renders biased solutions to CX problems. The one prescription of the Conventional CX – the full-scale and company-wide “Serve Customers Better” approach – doesn’t fit every company and all situations. Why would any sensible CEO take unnecessary risks to deploy this singular and subjective solution trying to solve the different CX challenges they face? 4. It can’t generate quick wins. The Conventional CX excludes ‘pricing’ and ‘product’ from customer journey maps. Thus, all business drivers would surely be ‘service’ or service-related attributes. It would become a project for enhancing service instead of driving quick wins or business results. Why should a pragmatic CEO support a pure service improvement initiative? 5. Its role is functional, not strategic. A Real CX includes everything that would affect the perceptions of customers about your brand. Its nature dictates its role – strategic not functional. The Conventional CX puts CX as a function parallel to Customer Service and Marketing. It only creates chaos and redundancies. A wise CEO would not add a CX function on top of existing functions or departments. As the Conventional CX is only about interactions, it should rightfully be renamed as CIM (customer interaction management) and cease to hijack the name “CX” any longer. CX is supposed to be necessary and good to all companies. However, because the Conventional CX is only suitable for or welcome those companies whose brand promises are ‘service’ or service-related, it becomes the privilege of the members of SERVICE club. Due to its one prescription – the company-wide and full-scale “Serve Customers Better” approach – the Conventional CX is unnecessary and bad to most companies. Furthermore, with its biased perspective and functional role, the Conventional CX wouldn’t be able to maximize the productivity of company’s limited resources. A wise CEO would never buy into the Conventional CX. There once was a brand that tried very hard to sell a ‘great product’ to its target customers, aimed at solving an important problem. However, most target customers refused to buy. For the minority who bought, the product didn’t work out at all. The brand shifted the blame onto customers, e.g. they didn’t read the user manual or use the product properly. Customers were wrong and must change. They seldom reflected yet kept on complaining, so much so that many target customers have turned their back on their ‘great product’ – for over a decade. As a CX professional, what advice would you give this brand? “They should shift from product-centric to customer-centric: Listen to their customers, and improve or swap the product.” It is blatantly obvious, isn’t it? Wake up! It’s you, not your customers, who are wrong and must change. That brand is us, that product the Conventional CX, and we are product-centric. “CX professionals should get a Worst CX Award. We practiced the worst customer experience management when dealing with our clients.” Sadly, it is not a joke. 1. An Emotion Curve is mapped by linking all the satisfaction levels of the sub-processes (touch-point experiences) and attributes that are encountered or perceived by customers and affect their emotions in a natural time sequence during a touch-point experience (total customer experience). 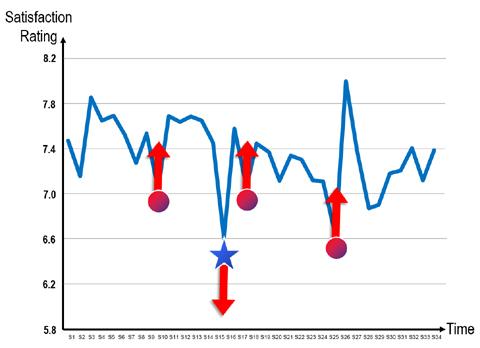 I created the Emotion Curve in 2006. See Sampson Lee, One Cup of Coffee, 20 Experiences: Take a Tip From Starbucks (Customerthink.com, 4 June 2006). 2. Global Starbucks In-store Customer Experience Research, Global CEM and CustomerThink (U.S.), September-October 2007. 3. Global IKEA In-store Customer Experience Research, Global CEM, CustomerThink (U.S.) and TOTE-M (Netherlands), December 2008-February 2009; Global Louis Vuitton In-store Customer Experience Research, Global CEM and CustomerThink (U.S.), October 2008. 4. For purposes of consistency and simplicity, in this article, the term ‘brand promise’ also covers brand value, brand purpose, value proposition and jobs-to-be-done. They all fulfill a similar cause: Create values for customers. 5. For ease of understanding, in this article, the term ‘customer needs’ is consolidated into three major categories: 1) ‘Service’ – such as service manner, professionalism, personalized service, self-service, relationship, convenience, speed, fun and caring; 2) ‘Product’ – like product quality, varieties, features, user-friendliness and product image; and 3) ‘Pricing’. 6. Global Starbucks In-store Customer Experience Research, Global CEM and CustomerThink (U.S.), September-October 2007; Global IKEA In-store Customer Experience Research, Global CEM, CustomerThink (U.S.) and TOTE-M (Netherlands), December 2008-February 2009; Global Louis Vuitton In-store Customer Experience Research, Global CEM and CustomerThink (U.S.), October 2008: Mainland China B2B Purchase Experience (IT Solution) Research, Global CEM and CustomerCentric Selling (U.S.), July-August 2007. 7. There are five types of valleys: 1) Inspirational Valley: By solving it, you can create innovative solution, product or business model. 2) Unnecessary Valley: There is little or no value generated for customers; customers suffer for nothing. 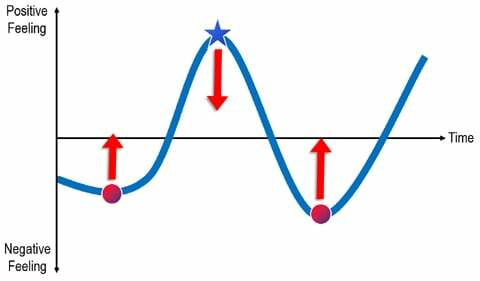 3) Good Valley: By allowing it, your Branded Peak can be further enhanced. 4) Bad Valley: When the Good Valley falls to a level deemed unacceptable by your target customers, it becomes a Bad Valley. 5) De-Branded Valley: The attribute (valley) is supposed to be the pleasure peak because it reflects your brand promise. To conclude, only the Good Valley should be allowed. For the remains, you should either solve, minimize, or eliminate, and spend different level of resource addressing them. 8. Global IKEA In-store Customer Experience Research, Global CEM, CustomerThink (U.S.) and TOTE-M (Netherlands), December 2008-February 2009. 9. Global Louis Vuitton In-store Customer Experience Research, Global CEM and CustomerThink (U.S.), October 2008. 10. Global Starbucks In-store Customer Experience Research, Global CEM and CustomerThink (U.S.), September-October 2007. 11. Global Louis Vuitton In-store Customer Experience Research, Global CEM and CustomerThink (U.S.), October 2008. 12. Ryanair has been one of the world’s most profitable airlines for years. In 2016, Ryanair was both the largest European airline by scheduled passengers carried, and the busiest international airline by passenger numbers. (Wikipedia, 4 March 2018). Sukiyabashi Jiro has earned and kept three Michelin stars for years. See Oldest Michelin Three Star Chef – Guinness World Records, retrieved 8 March 2018, from http://www.guinnessworldrecords.com/world-records/oldest-Michelin-three-star-chef. The place is so famous that former U.S. President Barack Obama asked to dine there during his visit to Japan in 2014. See David Jackson, Obama: ‘That’s some good sushi right there.’ (USA Today, 23 April 2014). 13. Global IKEA In-store Customer Experience Research, Global CEM, CustomerThink (U.S.) and TOTE-M (Netherlands), December 2008-February 2009. 15. Minimum standards are criteria set internally by companies. They are the lowest level performance a company allows and could be anything from maintaining a certain rating level by complying with particular standards, to tracking discretionary measures, such as number of complaints generated. Unacceptable levels are derived externally from customers. They are the performances that would drive a specific segment of customers away or generate seriously negative word-of-mouth. These experiences can be identified by analyzing empirical data or running the correlation and regression analyses using the X-VOC research. 16. We had a causal conversation with the IKEA business executives in Mainland China. They shared the same view that more resources should be dedicated to making ‘Product pricing’ their peak since it is IKEA’s brand promise universally. 17. Global Starbucks In-store Customer Experience Research, Global CEM and CustomerThink (U.S.), September-October 2007. 18. X-VOC (Voice-of-Customer @ Experience) Data are generated by customer research to obtain the satisfaction ratings and derive the importance levels of each sub-process (touch-point experience) and attribute during a touch-point experience (total customer experience). 19. Global IKEA In-store Customer Experience Research, Global CEM, CustomerThink (U.S.) and TOTE-M (Netherlands), December 2008-February 2009. 20. Global Starbucks In-store Customer Experience Research, Global CEM and CustomerThink (U.S.), September-October 2007. 21. Global Louis Vuitton In-store Customer Experience Research, Global CEM and CustomerThink (U.S.), October 2008. 22. The TCE (Total Customer Experience) Model maps the matrix of all the touch-point experiences in which customers interact with a company or a brand during the entire customer lifecycle using X-VOC Research to derive the importance levels of each of the touch-point experiences that drive target business results. I created this model in 2009. See Sampson Lee, Building an Effective Total Customer Experience Model for Telecom Operators (Customerthink.com, 28 May 2009). 23. Mainland China Credit Card Customer Experience Research, Global CEM, May-June 2008 and May-July 2009. 24. Global Mobile Communications Customer Experience Research, Global CEM and CustomerThink (U.S.), March-May 2009. 25. The importance rankings in the research findings shown in this article were generated using the derived importance approach with regression analysis. I’m very grateful for this download of your expertise. There are few practioners who can scan the entire CX horizon and still spot the gazelle on the horizon as well as you. I am sure I will return to this article again and again. About 1000 times more useful than the ‘dummies guides to CX’ too readily available. Hi Christopher, thanks for your nice words and I am delighted you found this article useful! Hi Thomas, it’s utmost important to get it right – include ‘pricing’ and ‘product’ in CX, and I am glad you agree with me. My best wishes to your pitch!